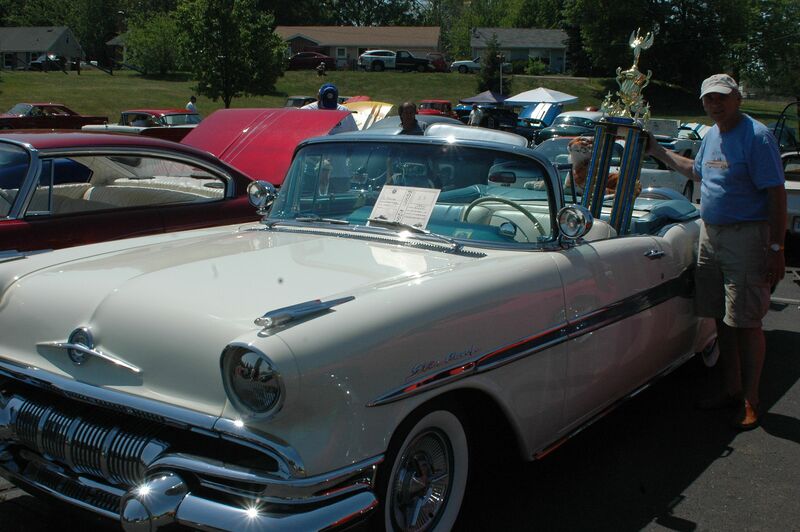 The sky stayed blue without a cloud as 132 entries participated in the 24th Annual Cruisin’ ‘Cuse Car Show, still known as the Biggest Little Car Show in Indiana. Rob Vandal, event chairman for the host Wawasee Kiwanis Club, stated it was a “great day” with the entries up from 104 last year. He presented trophies to winners in 27 different classes and seven specialty awards. The cruise-in Friday night on Main Street in the uptown area of Syracuse reportedly had 120 car participants. Participants anxiously waited through the various class awards to hear who won the top awards for the show. 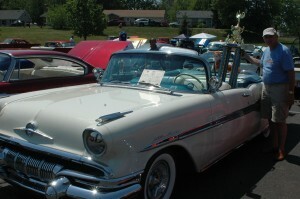 A 1957 Pontiac Starchief Convertible, owned by Lanny Rogers, was the winner of the Best of Show award. The award was sponsored by Bill’s Automotive. The Kiwanis Choice winner, sponsored by Newcomer Construction, was a 2001 Harley Fatboy owned by Merle Bontrager. Sam Craig’s 1932 Ford Roaster was chosen the Best Engineered Hot Rod, sponsored by Napa Auto Parts, with Roy Hauth’s 1954 Jaguar XK 120 winning the Police Chief’s Choice, sponsored by Wawasee Boat Works. Bob Eastman took the Best Engine award with his 1936 Auburn Speedster. The award was sponsored by Guardian Industries. Best Paint, sponsored by Buds’s Body Shop, was presented to Devoe Hoffer’s 1966 Nova and the Best Interior award, sponsored by Jasper Plastic Solutions, went to Ted Cook’s 1950 Hudson Coupe.